Click on the desired image or title to go straight to the rental booking page for that particular copier. Below you will find representative hire & rental copiers from our range and the copier rental prices which apply. Photocopier machines rental is our forte! SHARP MX2300 - PC & MAC COMPAT. Absolute Office Centre offers a range of copiers to suit short or long term office copying requirements with the above brands plus Xerox and others. We can supply a new machine to purchase out-right and we have access to a wide range of refurbished machines for sale as well. 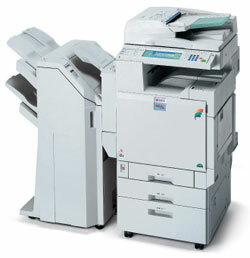 Note: Our copier rentals or hire prices are Subject to Change without Notice. Toner & ink costs are additional. To make a copier rental inquiry, please feel free to contact us either by telephone (on 0418 574 767 or in Victoria on (03) 8420 7788), email or by using our Inquiry/Booking Form. We will endeavour to respond to your email or Inquiry Form submission within 24 business hours. As our available products change regularly, it is not possible for us to list every photocopier we have for rent/hire on this site. If you cannot find the Photocopier you are looking to rent / hire here, please call us (on 0418 574 767 or in Victoria on (03) 8420 7788), email us or use our Inquiry/Booking Form to make an inquiry. We will endeavour to respond to your inquiry within 24 business hours. We also sell Photocopier machines. No matter whether you're in Sydney, Melbourne, Perth, Brisbane, Adelaide, Canberra, Darwin or Hobart, we can supply. Please feel free to call us (on 0418 574 767 or in Victoria on (03) 8420 7788), email us or use our Inquiry Form to make an inquiry regarding photocopier machines for rent, hire or for sale & prices. We will endeavour to respond to your inquiry within 24 business hours in Melbourne Australia.